AS THE new university year begins, students across South Africa who were not assigned accommodation at their respective universities are scrambling to find housing elsewhere. A 2011 report by the Department of Higher Education and Training on the provision of student housing at South African universities says only 20% of students are accepted into university accommodation each year. That means there is an estimated shortage of 207,800 beds for the 2013 university year. Commenting on the availability of student accommodation at the University of Johannesburg (UJ), spokesman Herman Esterhuizen said it was provided on a first-come, first-serve basis. There are 49,000 students enrolled for under- and postgraduate studies at the university. “The university reserves approximately 2,000 bed spaces for first-year students across all campuses,” he said. “In total we can accommodate 6,500 students in the 30 residences. “UJ student accommodation received 18,500 applications for 2013 before the deadline (October 26 2012) and a further 10,500 after the deadline,” he said. In 2011, the institution made available two new campus residences. Plans to build more residences are under way. At the University of Cape Town (UCT), the top university in Africa, 6,577 students can be accommodated in campus residences. The university received more than 24,000 accommodation applications from students. Moonira Khan, executive director in the department of student affairs at UCT, said the possibility of building new residences in the future was being discussed, given the high demand. Sinegugu Ndlovu, spokeswoman for the Durban University of Technology (DUT), said the institution had a capacity of 4,300 beds. “DUT receives more than 5,300 applications for resident admissions in Durban annually,” she said. Preparations are under way for a DUT student village that will house about 800 students. Meanwhile, the market for off-campus student accommodation is growing. Johannes Seolela, spokesman for Ugate, a company that helps students find off-campus accommodation, said more students required the company’s services every year. “Students in Johannesburg who attend UJ or Wits (University of the Witwatersrand) ideally look for accommodation in Braamfontein and Auckland,” he said. “The price range they look at differs from student to student simply because they require different services from the places they want to live. In terms of rental payment, 90% of the students are able to keep up on a monthly basis,” he said. Despite there being other accommodation options for students, the South African Students Congress is adamant that it is a university’s responsibility to provide housing. 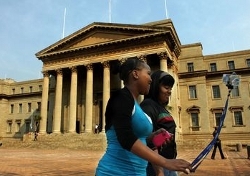 Secretary-general Themba Masondo said universities should change their admission criteria. Graeme Block, speaking in his capacity as a member of the University of Cape Town council, said it was difficult for institutions to keep student residences in the black. “We need more residences for students, but residences are not money-making institutions. They are low cost to students but they provide amenities, both social and educational, that are conducive to a good learning environment,” he said. “When students are off-campus, their ability to learn might be disrupted by the environment. For example, a student renting a room at the back of a shebeen may not be able to study because of a party going on,” he said.